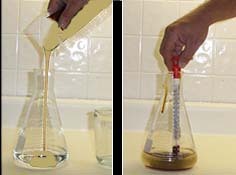 The yeast starter needs to be prepared 36 to 48 in advance of the time you intend to actually brew. (Directions on the package will instruct you in determining the time frame). Clean, sanitize and rinse all equipment. 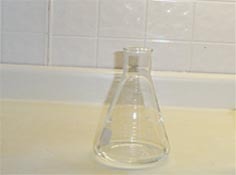 STEP 5 Put 500 ml good drinking water in the Pyrex flask. STEP 6 Microwave water in flask about 3 minutes or until water is reasonably hot enough to dissolve malt. STEP 7 Add 5 oz. 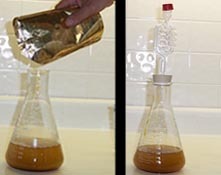 package of malt and stir until malt is dissolved. STEP 8 Return flask to microwave and heat until mixture just starts to boil. 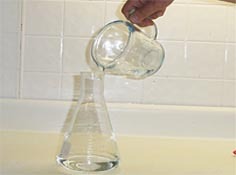 STEP 9 Remove flask from microwave and place in an ice and water bath (add one cup of salt to make the bath even colder). 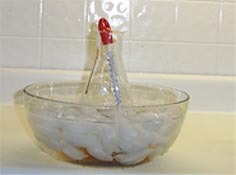 Use your thermometer to monitor the temperature of the mixture. for approximately 24 hours until time to pitch.